There are strange low hills in the vicinity of The Port of Felixtowe in Suffolk. Not the product of tectonic upheaval or Ice-Age earth shifting but man-made plateaus of painted steel. Around what is the largest container port in Britain vast acres of stacked shipping containers afford the local topography a distinct Legoland character. 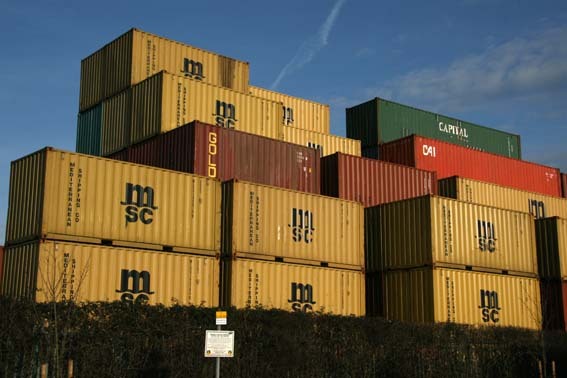 Ugly they may be, but containers can be piled high, safely and efficiently – this is really the whole point of them. Cross the Orwell estuary to the other bank and the mechanics of the terminal seem somehow easier to discern from a distance. 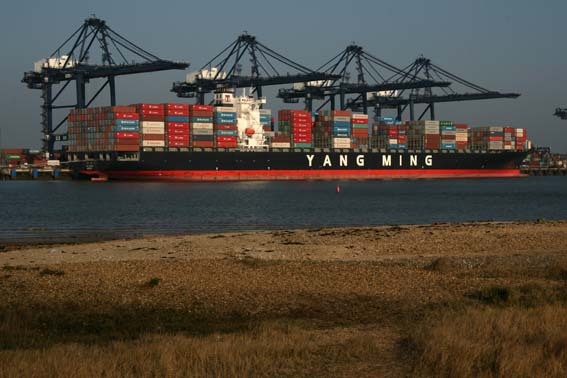 Looking north across the water from Shotley Peninsula the enormity of the container ships becomes all too apparent, as does the immense volume of their gargatuan payloads. The juxtaposition of the tranquil saltmarshes, silent but for the piping of waders, and the distant metallic rumble of behemoths docking across the water strikes an oddly unsettling note. There is something a little inhuman, sinister even, about shipping containers. Perhaps they are too much like a human-sized tin cans for comfort. They evoke fears of incarceration, claustrophobia – a living grave. Such fear affords them considerable dramatic possibilities. A European shipping container was central to the plot of the second season of the acclaimed HBO production The Wire. In this, McNulty, the anti-hero cop who had been exiled to Baltimore Docks, found himself involved in a case concerning a shipping container full of dead young East European women, the victims of a people trafficking scheme that had gone terribly wrong. Even the British soap Brookside once invoked a container for criminal purposes when top-dog ‘scally’ Barry Grant locked a business opponent in a shipping container at Liverpool Docks. We never learned of his fate – or if we did, I had stopped watching by then. Containers seem to fit snugly into the lexicon of crime pulp fiction and the threat of tinny incarceration provides a welcome alternative to hackneyed themes of ‘swimming with fishes’ or being concreted into flyovers. Shipping containers can be found in the most unlikely of places, not just ports. Travel about as far as you can get from an ocean – Central Asia, say – and you’ll still find them in large numbers, not so much as moveable storage but more as make-do business premises. 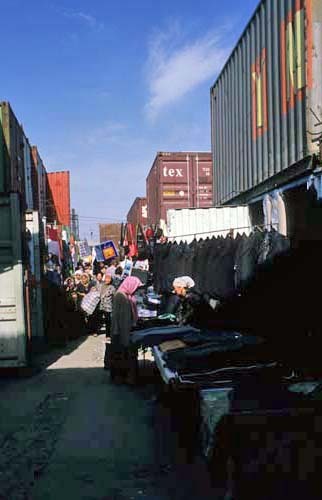 Both of Kyrgyzstan’s two largest markets make extensive use of them, double-stacked in parallel rows to create narrow shopping streets of easily-secured retail premises. In the capital Bishkek, you can find pretty well anything you might need at the Dordoi Bazaar north of the city. While the sellers are mostly Kyrgyz, many of the shoppers strolling the market’s metallic thoroughfares come from further afield – Kazakhstan or even Russia. Larger still is the market at Kara-Suu right on the Kyrgyz-Uzbek border close to Osh in the south. This one really is the largest market in all Central Asia. Kara-Suu is the grey economy writ large. Almost entirely populated by ethnic Uzbeks, this is the place to buy very cheap Chinese goods -clothes, electronic goods, household wares – just don’t expect a guarantee or 6-month warranty. The market is long-established and dates from Soviet times when the meandering Kyrgyz-Uzbek frontier really did not mean that much. These days Kara-Suu is closed down periodically by the authorities but most of the time shoppers from Uzbekistan are able to sneak or bribe their way across this the border to buy goods at much cheaper prices than at home. Sometimes they even bring raw cotton to sell at a premium in Kyrgyzstan. Bazaars like Kara-Suu are hardly typical. 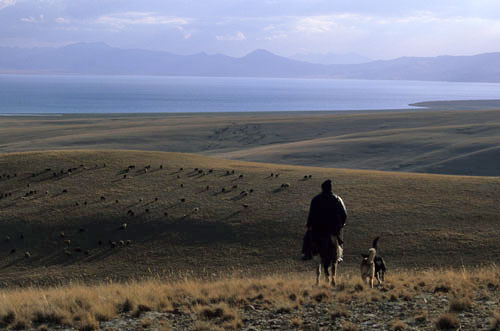 Away from Bishkek, Osh and a handful of small cities, Kyrgyzstan is by and large rural – wild, mountainous and very beautiful. The country may be very long way from any ocean but it does have some stunning high-altitude lakes like Issyk-Kul and Song-Kul (above). No container ships, though. This entry was posted in Suffolk, Travel and tagged Bishkek, central asia, Felixstowe, Kara-Suu, Kyrgyzstan, port, shipping container, Suffolk, Uzbekistan. Bookmark the permalink.